How was your Thanksgiving? In the D.C. area, we were not only treated to a holiday, but also some spectacular late November weather. Sun, light wind, and temperatures in the mid-sixties. At least not all the good weather happens while I’m at work. Here are the weekend highlights from this neck of the woods. Felkerino and I spent Thanksgiving with family in Reston and our job was to show up with dessert. 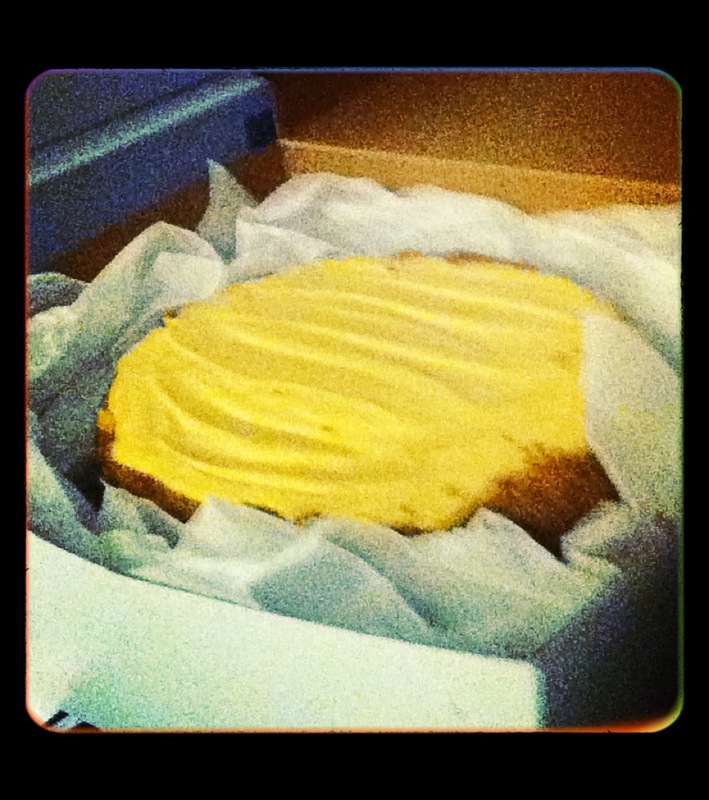 Not feeling a desire to cook, I picked up a pumpkin cheesecake from Baked and Wired in Georgetown. Perhaps the young man had not connected the dots on what I had just said. “I’m taking it home on my bicycle.” While I appreciated his concern, a teeny dent from a finger was the least of my worries, as I was not only riding the cake home, but taking the cheesecake with me on Felkerino’s and my 25-mile journey to the Northern Virginia suburbs. I rode off with the boxed up cheesecake in my Carradice bag, as the cake box was too wide to fit into my small Ortlieb pannier. After getting the cake safely home, Felkerino and I repositioned the cheesecake in another Tupperware container so as to avoid the fragility of the cardboard cake box. Amazingly, the cheesecake fit just perfectly into my Carradice College saddle bag. That bag is amazing, as it holds a lot of stuff while not looking too bulky. After Felkerino’s and my Cranksgiving ride, the cheesecake looked as though it had been bumped a few times along the way, but overall it looked pretty good. Definitely edible. 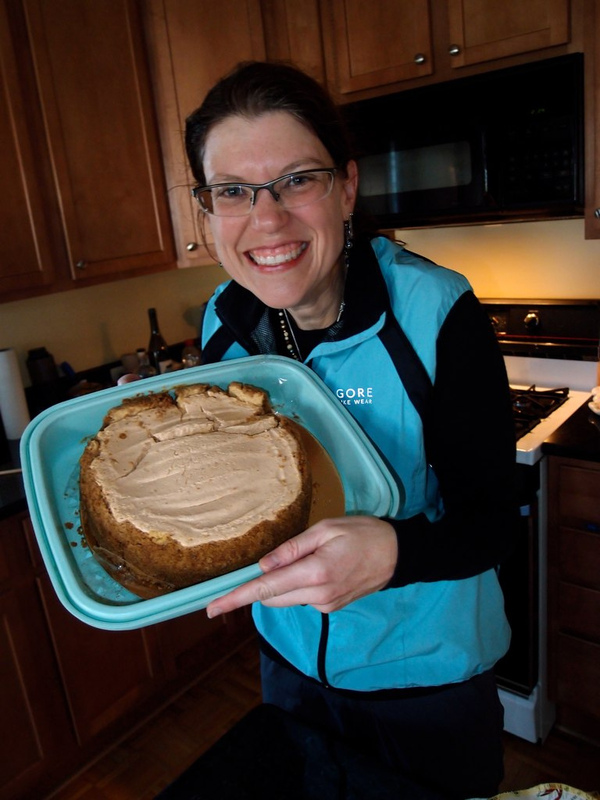 Something dense like cheesecake is a good thing to transport by bike in the fall. The cooler weather won’t melt the cheesecake into a puddle, it doesn’t flop around too much due to its heft, and even if it is a little banged up in transport the jostles won’t destroy it. And the taste of this cheesecake? Absolutely incredible! The pumpkin flavor was subtle, the cheesecake rich, and the graham cracker crust (or whatever it was made of) had just the right amount of buttery crunch to it. Cheesecake upon arrival. Slightly slumped, but overall good. I felt pretty righteous for riding out to Thanksgiving Dinner. It was a great day to be out on the bike, as the roads were quiet and the people who were out in their cars or getting in their pre-Thanksgiving exercise seemed relaxed and pleasant. The ride home was a little tougher due to my full stomach, but it gave Felkerino and me a chance to ride off a little of our Thanksgiving feast. 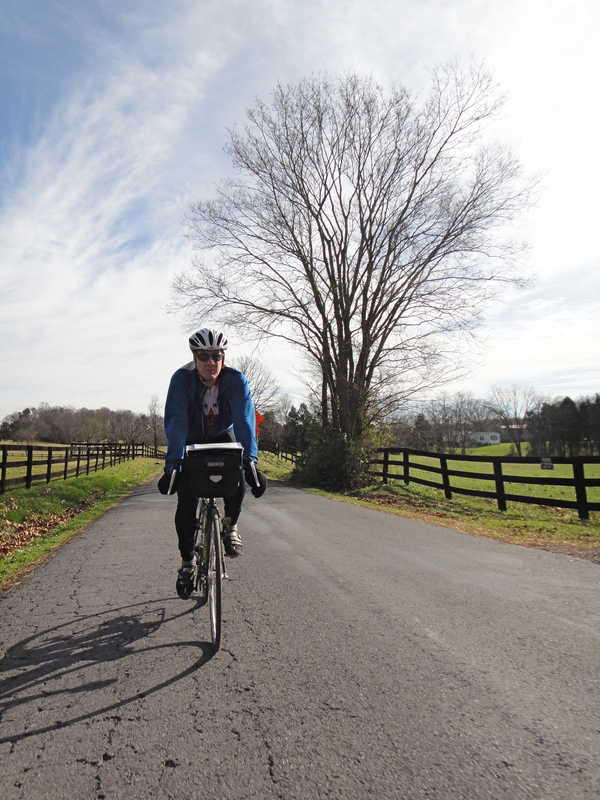 Saturday we met up with Chuck and Crista and friends to ride the Sivanova Century out of Warrenton, Virginia. The ride was largely uneventful except for David R.’s exciting mechanical. 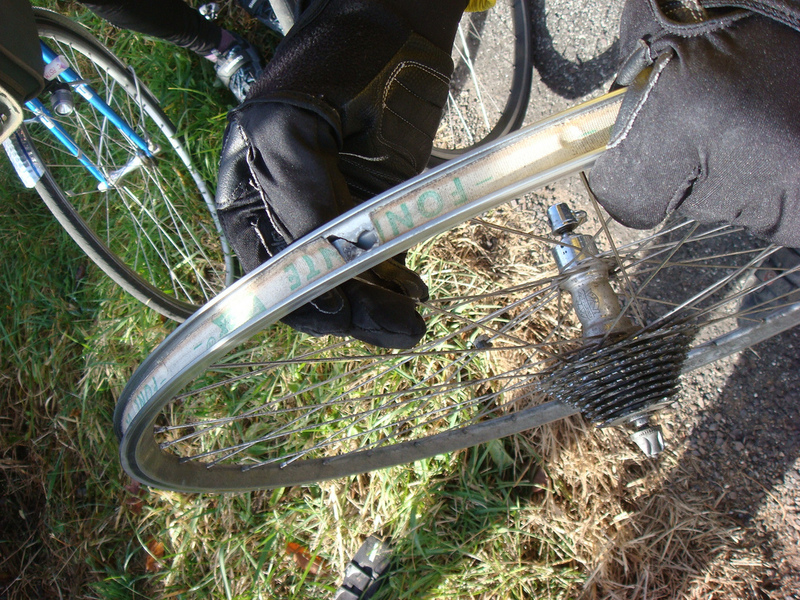 About 45 miles down the road David flatted and, upon closer inspection, learned that his tire rim was crumbling. His rim was cracked near the tire valve and the inside of the rim was rough due to corrosion. 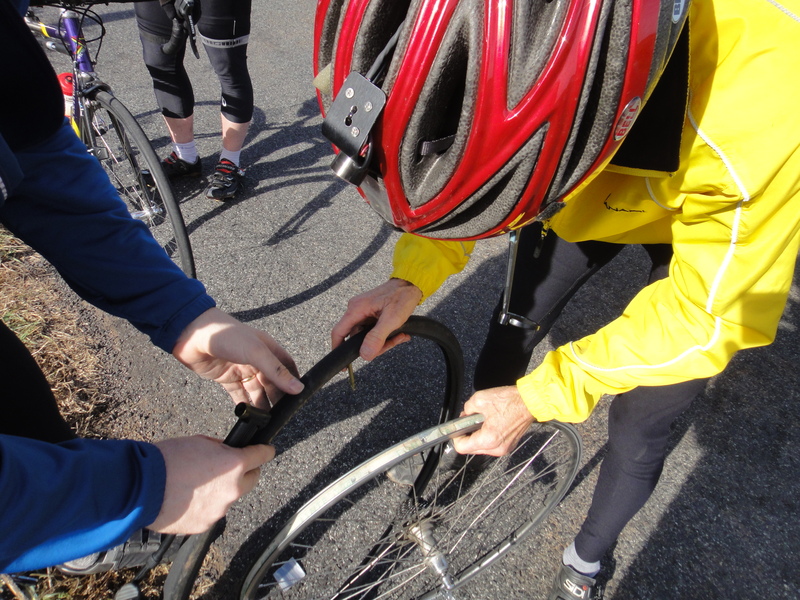 Putting in a new tube would just prompt the tire to flat again as the uneven surface of the rim would puncture the tube. What could be done? Fortunately, David was accompanied by Mike, who had an ample supply of duct tape. In addition, Chuck came up with a brilliant boot idea. Apply a duct tape boot over the corroded area and over the valve to smooth out the inside of the rim. Puncture the duct tape with the valve and hope that all would be well. 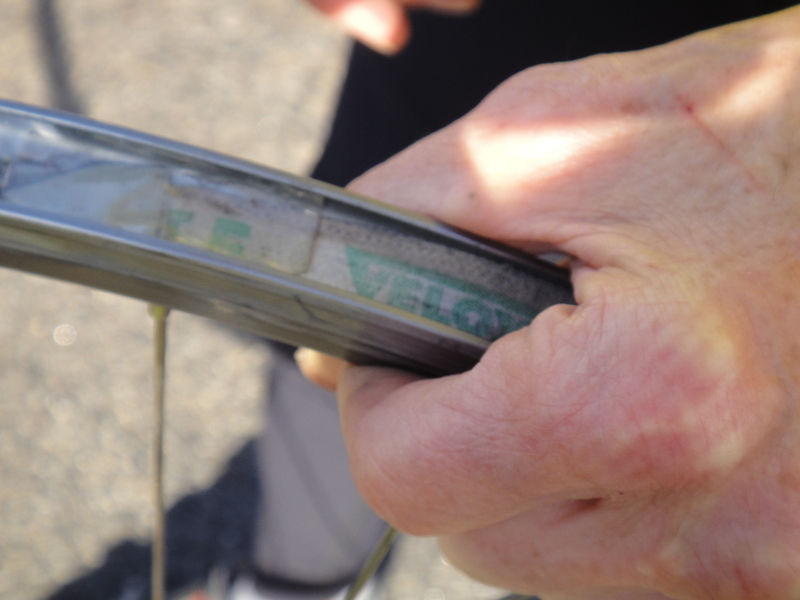 After devising the boot and documenting its application as well as the overall rim condition, we pedaled on. David’s tire stayed inflated for the next several miles and he smartly decided to shortcut back to the parking lot after lunch. As far as I know, he made it back without incident. Other than David’s rim fail, the rest of this century ride passed peacefully. The temps reached into the 60s, the terrain was gently rolling, and the wind was calm. There are no epic climbs on this ride, but the roads are quiet, and the lunch stop at the Inn at Kellys Ford is a winner. Felkerino took photos (here), as did I (here). 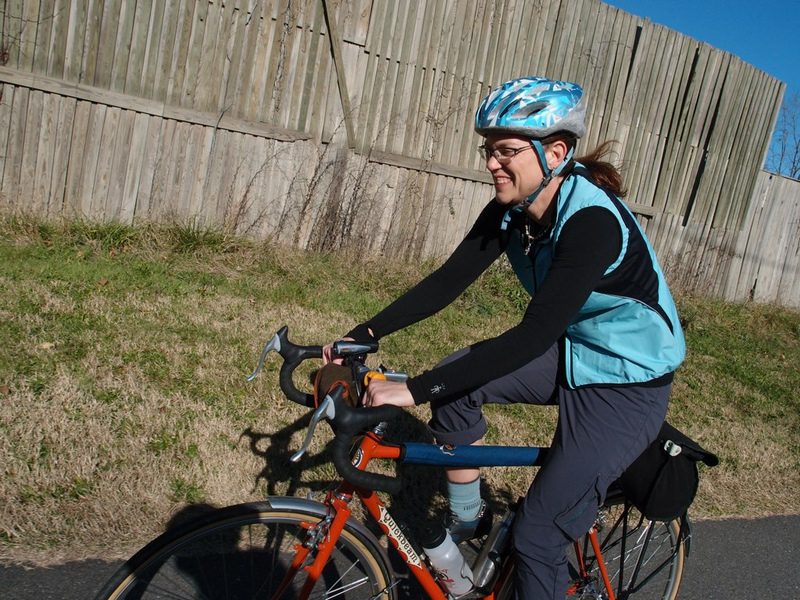 Sunday, we did our coffeeneuring shortie ride to Potomac via Baked and Wired. Tons of riders were out. We also saw that the local businesses had been hard at work sprucing up for the December holidays. 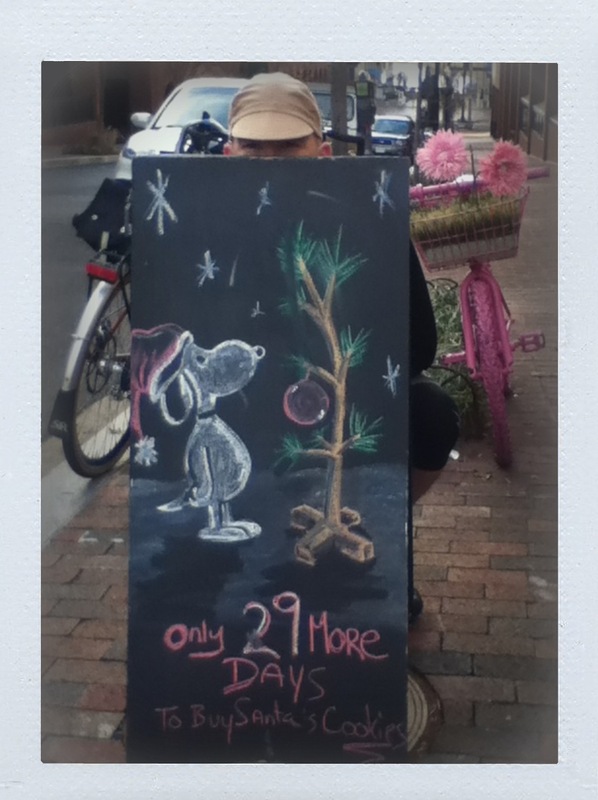 Only 29 Days to buy Santa’s Cookies! I like seeing all the different things that people put up for the month of December. It makes the cycling more festive, and I love how the holiday lights warm up the nights. Glad to hear that you successfully carried your cheesecake on your bike! I was not so lucky with my pumpkin pie– it got smashed to bits. I think that if I had a bag that I could have laid the pie more horizontally, it would have fared better. Ah well. OK: i think you have proved that a cheesecake can “safely” be transported via bicycle carradice. so: i’ll take one. to go. i’ll give you directions to my place in alaska.